When you submit your app to the Amazon Appstore, you must include various screenshots of your app to include with your app's listing. 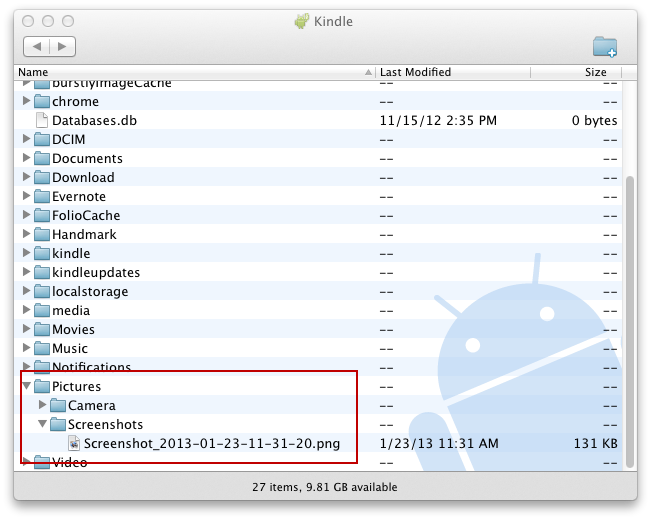 This guide describes the process of taking screenshots on various Fire devices. For a list of required images, see Image Guidelines for Amazon Appstore Submission. Connect to your Fire TV device through ADB. Change filename.png to the screenshot file name you want. Note that /sdcard is actually an emulated SD card. No physical SD card is required. Change /tmp to the directory on your computer where you want to transfer the screenshot. Note: You don't need a 1920px monitor to get these same dimension in your screenshots. When you take a screenshot for a Fire TV device, the default dimensions are 1920 x 1080px. To record a video on Fire TV, follow the same steps outlined in the Android documentation. Type adb shell screenrecord /sdcard/x.mp4 to start recording (replacing x with the desired video name). Press Ctrl+c to stop the recording. Then type adb pull /sdcard/x.mp4 /tmp/x.mp4 to move your video into the tmp folder on your computer. For most Fire tablets (2013 models and newer), you can use physical buttons on the device to take screenshots. If you are developing for older Fire tablets, you can take screenshots from your development computer. With the device powered on, press and hold down the Volume Down button and Power button together for one second. The screen will flash briefly and a smaller image of the screen will appear in the center of the screen to indicate a successful screenshot. If the volume is turned up, you'll also hear a shutter sound just before the screen flashes. Using a USB cable, connect the tablet to your computer. On Windows: Navigate to Internal Storage > Pictures > Screenshots on the device. The screenshots are saved with filenames that include the year, month, day, hour, minute, and second in the format: Screenshot_yyyy-mm-dd-hh-mm-ss.png. 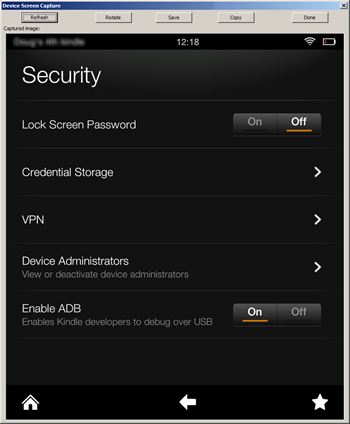 You can take screenshots from older Fire tablets (2012 and earlier) and other Android tablets using the Eclipse IDE, a popular desktop developer tool for Android. Connect the tablet to your computer as described in Connect to Fire Tablet through ADB. In Eclipse, from the Window menu, select Open Perspective > Other… > DDMS. Select the tablet, and click the camera icon. (If the tablet isn't shown, from the Window menu, select Navigation > Show View Menu > Reset adb) The Device Screen Capture window shown below displays the current screen as shown on the tablet. If the device screen saver is on, the window shows what would be on the screen if the screen saver was not running. Save the screen by clicking Save. When you are finished taking screenshots, click Done.